A lot of things to think about. A lot of things to do. But one problem, so little time. I missed blogging. Its been a while, I've been busy with our thesis and with our requirements. Eleven days passed by, since my last blog. I told to myself, I'll try to update my blog as often as I can. On the other hand, my laziness is one of the hindrance. haha. *kaya ngayon na lang ulit ako nakapagblog* I have more stories to tell. Lets go back the day before that. July 19,it was Sunday. I woke up early. I went to church by myself cause my mom and sister was still asleep. When I was in the Church, I remembered a portion of my love story, I spotted a cute guy praying solemly by himself. At the back of my mind, "the love story was coming true?? wow! eto na po ba sya?" *hallucination was occuring that time to me with kilig* For the reason, that its seldom to see a cute guy praying in the church. A God-fearing guy? Nowadays, you'll see them in the missionaries. Am I right? After the mass, I'm late. What's new? 8am was the call time but I arrived around 10am. I'm very sorry for that but I have a good reason behind my tardiness. I lighten one candle for our thesis and one for the success of team building. See! A good reason to be late. We're all busy brainstorming, buying stuffs and preparing all the materials needed. Mall hopping was one major activity, it was hard without a private vechicle to use. Taxi to walking to walking to still walking. I felt I lose 10 pounds for that. Cool. :) instant lipo. hahaha I went home around 9pm. Next day, I was late again. Aaarrgg! Traffic. However, I saw a friend. *sabay kami sa fx, yehey! * My friend was late for an exam, while I was late for a quiz. My prof gave some consideration, I'm happy, even though I haven't answer some of the questions. At least, I have some answers. We watched a film. Dismissed. Team building! Oh my. It was fun. Exciting. I was the one incharge for the documentation. I volunteered myself to be able to take some pictures of my crush without being too obvious. *stalker alert* It's hard to pretend, I don't know the person. I guess, I'm good playing the role. ;)) The activities were done, time to go home. Over-all, it was great. At last, I can breath! One down, more to go. The seminar was conducted by our block section, I'm incharge with the raffle draw. Love it! Exposure. Too bad, some of our invited audience did not came. :( On the contrary, It's also a success. Again, One down! wooh. Cancelled for the nth time! Beacause of the weather, rally, sona, and the annivesary of the Iglesia ni Christo. Finally, we have the title and the chapter one! Ride on. :)) Thanks to my patient groupmates. We discussed our thesis almost everyday in YM using conference. Without YM we're nothing. hahaha Without other people we're also nothing. We passed the draft of the first chapter yesterday. Busy like a bumble bee. Last time, I have 64 unread messages on my cellphone it was all forwarded messages. No time to read. Right now, my cellphone is for emergencies only. *tagal ko din hnd nagUnli. Katamad na magcellphone gastos din magload. * I'm enjoying to be busy and active. I'll not stop from being busy. 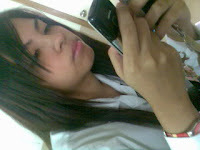 :)) *busy busyhan* I'm loving it!